Below you fill find all funeral homes and cemeteries in or near Wall. Popular neighborhoods in Wall include: Glendola, Allaire, Carmerville, Osbornes Mills, Sterling Woods, Algers Mills, Blansingburg, Remsen Mills, Baileys Corner, New Bedford, Allenwood, and West Belmar. Suburbs of Wall: Wall Township, Wall Twp, Tinton Falls, Bricktown, Lake Como, Neptune City, S Belmar, Shark River Hills, Shark River Manor, South Belmar, Spring Heights, Spring Lake Heights, W Belmar, West Belmar. Wall is also known as: Wall Township, and New Jersey. Their current mayor is Mayor Jeffry Bertrand. Zip codes in the city: 07719, 07727, 07731, 07753, 07762, 08724, 08736, 08750. Some of the notable people born here have been: George Gelnovatch (coach), Charlotte Sometimes (songwriter and musician), and Tim Wright (american football player). Wall Township is a township in Monmouth County, New Jersey, United States. As of the 2010 United States Census, the township's population was 26,164, reflecting an increase of 903 (+3.6%) from the 25,261 counted in the 2000 Census, which had in turn increased by 5,017 (+24.8%) from the 20,244 counted in the 1990 Census.Wall Township was formally incorporated as a township by an act of the New Jersey Legislature on March 7, 1851. 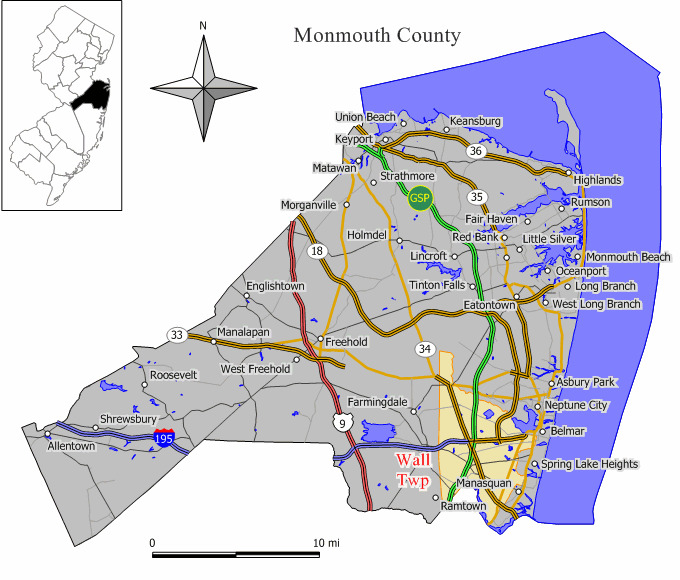 Over the years, portions of the township have been taken to form North Spring Lake (May 1884), Ocean Beach (March 9, 1885, now Belmar), Manasquan (December 30, 1887), Spring Lake, (March 14, 1892), Sea Girt (March 29, 1917), Brielle (April 10, 1919), South Belmar (March 12, 1924, now Lake Como) and Spring Lake Heights (March 19, 1927). It was disclosed on September 24th, 2017 that Annette Marie Arnoul died in Clearwater, Florida. Arnoul was 76 years old and was born in Wall, NJ. Send flowers to express your sorrow and honor Annette Marie's life. It was disclosed on November 25th, 2016 that Mary Ferrell died in Wall, New Jersey. Ferrell was 88 years old. Send flowers to express your sympathy and honor Mary's life. It was disclosed on October 4th, 2014 that Florence L Kriney (Martin) perished in Wall, New Jersey. Ms. Kriney was 96 years old and was born in Unionville, NY. Send flowers to express your sorrow and honor Florence L's life. It was disclosed on December 29th, 2013 that Larry Evernham perished in Wall, New Jersey. Evernham was 66 years old. Send flowers to express your sorrow and honor Larry's life. It was revealed by Union Democrat on January 7th, 2013 that MaryAnn Allaire (Mendenhall) perished in Tuolumne, California. Ms. Allaire was 72 years old and was born in Wall, NJ. Send flowers to express your sympathy and honor MaryAnn's life. It was reported by Monterey Herald on January 4th, 2013 that Maryann Allaire (Mendenhall) passed away in Tuolumne, California. Ms. Allaire was 72 years old and was born in Wall, NJ. Send flowers to express your sympathy and honor Maryann's life. It was disclosed on March 30th, 2012 that Helen Hauke (Pecci) perished in Wall, New Jersey. Ms. Hauke was 88 years old. Send flowers to express your sorrow and honor Helen's life. The official website for the city of Wall is http://www.wallnj.com/. It was at the funeral for Haslem's mother ... then Travis Outlaw and Joe Smith for New Jersey on Sunday - have missed every shot they've tried against the Heat, that foursome combining miss all 21 of their attempts. "They use their length. Jackson Funeral Home, Wall Township, NJ : Reviews and maps - Yahoo! Local, 732.988.0043. Get Ratings, Reviews, Photos and more on Yahoo! Local. Wall Funeral planning made easy! Learn how to pre-plan your funeral in Wall, New Jersey, including step-by-step directions. We work with local florists and flower shops to offer same day delivery. You will find budget sympathy flowers in Wall here. Our funeral flowers are cheap in price but not in value.